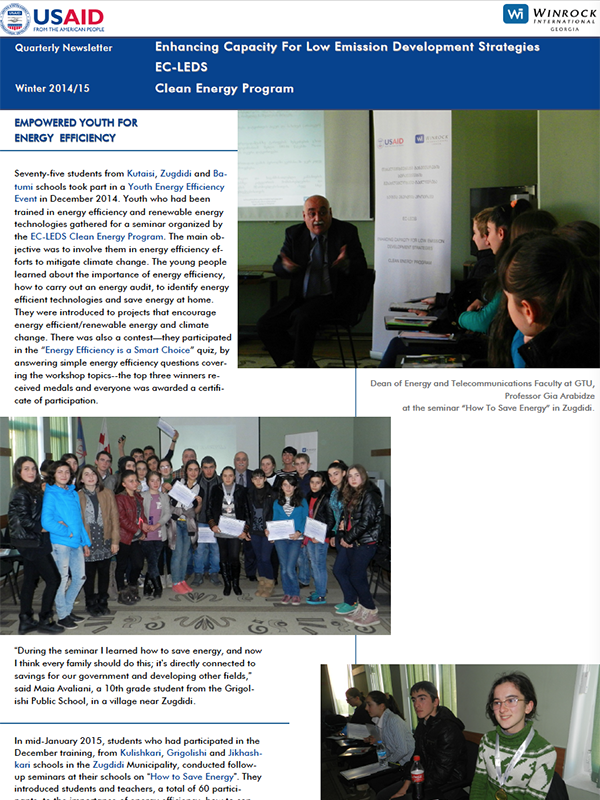 Seventy-five students from Kutaisi, Zugdidi and Batumi schools took part in a Youth Energy Efficiency Event in December 2014. Youth who had been trained in energy efficiency and renewable energy technologies gathered for a seminar organized by the EC-LEDS Clean Energy Program. The main objective was to involve them in energy efficiency efforts to mitigate climate change. The young people learned about the importance of energy efficiency, how to carry out an energy audit, to identify energy efficient technologies and save energy at home. They were introduced to projects that encourage energy efficient/renewable energy and climate change. There was also a contest—they participated in the “Energy Efficiency is a Smart Choice” quiz, by answering simple energy efficiency questions covering the workshop topics–the top three winners received medals and everyone was awarded a certificate of participation.